Free Noosa Single Serve Yoghurt (5.5-8 oz., any variety) in Kroger stores, with coupon. This Kroger Free Friday Coupon is available for download on Friday, October 6, 2017 but you have until October 22, 2017 to redeem it. What is Noosa Single Serve Yoghurt? An indulgent yoghurt unlike anything you’ve ever tasted, from farm-fresh whole milk, that has a unique combination of sweet and tart taste plus a thick, velvety texture. Ingredients – Vanilla Yoghurt: Grade A Pasteurized Whole Milk, Cane Sugar, Pure Vanilla Extract, Honey, Vanilla Bean, Kosher Gelatin, Pectin, Live Active Cultures (S. Thermophilus, L. Bulgaricus, L. Acidophilus, Bifidus, and L. Casei). 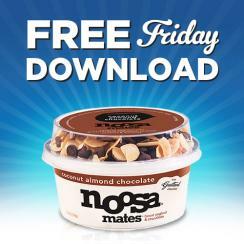 Redeem your coupon in-store within 2 weeks for One Free Noosa Single Serve Yoghurt (5.5-8 oz., any variety). Your coupon will automatically be applied at checkout when you use your Shopper’s Card. Available in most stores.